As Los Angeles braces for the likelihood of one or more new football stadium projects, the National Basketball Association’s Los Angeles Lakers have unveiled plans for a sports facility of its own. Rossetti, a design firm specializing in the sports and entertainment industries, teamed up with the L.A. office of Perkins+Will on a 120,000-square-foot training center and administrative headquarters. Slated to open in spring 2017, the project provides the Lakers organization with a significant facilities upgrade from their current leasing arrangement at the Toyota Sports Center in nearby El Segundo. 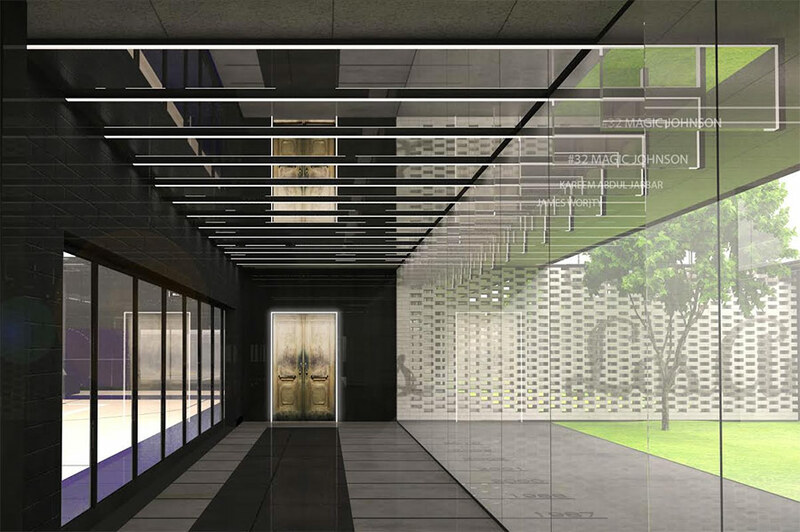 Preliminary renderings of the exterior depict a subtly detailed, rectilinear structure occupying a corner lot, the warm-hued second-floor volume floating over a concrete base. Vertical fins, featured prominently, work to shade direct sunshine as well as limit direct visibility, opting instead to give visitors fleeting glimpses of activities within. While the new headquarters might be seen as part of an increasing trend of developing exclusive facilities for professional sports teams, the Lakers’ case is unique: it seeks to consolidate all of its seasonal and year-round operations under one roof. “For the design, we wanted to incorporate the idea of an innovative workplace, where hierarchies are removed, and people come across each other in a common social space,” explained Rossetti design principal Jim Renne. The hope is to create an integrated environment for all levels of staff, executives and players alike in which to interact. “You can hear a basketball bouncing, or you catch a glimpse of star player,” he said, imagining hallways in the new two-level facility. The Lakers Headquarters positions itself as both an architectural centerpiece for a brand recognized worldwide, as well as an asset to the local community. The organization has chosen to remain in El Segundo, a small oceanside city in greater Los Angeles, due to its long-term ties there and, perhaps as importantly, its proximity to Los Angeles International Airport. 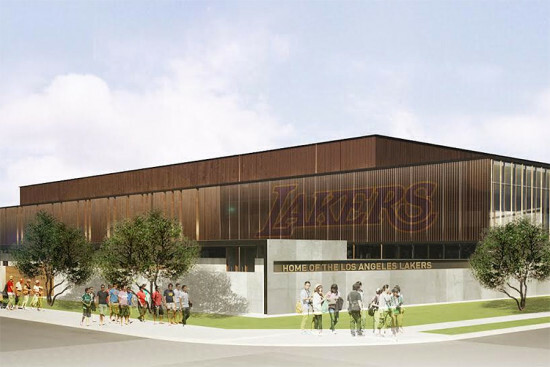 It will also serve as home for their Development League affiliate team, the Los Angeles D-Fenders, incorporating a 750-seat venue for hosting games and other public events.